"These fresh grilled fruit and veggie kabobs are a great healthy dinner your family will love. Plus, using aluminum foil prevents these kabobs from sticking to the grill, and makes cleanup a breeze." Heat grill to low, 325 degrees 350 degrees . 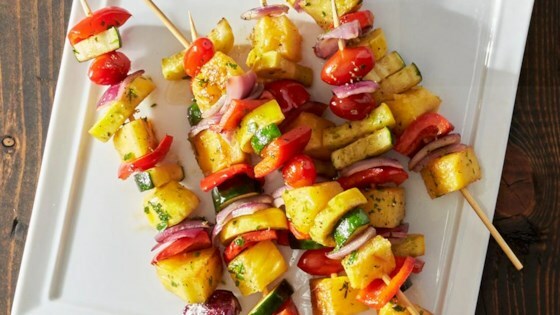 Assemble kabobs, alternating different vegetables and pineapple on wooden skewers. Combine all ingredients for marinade in medium bowl and mix well. Brush marinade onto fruit and veggie kabobs. Line grill with Reynolds Wrap(R) Aluminum Foil. Place kabobs on grill on aluminum foil and grill for 10 to 15 minutes, or until veggies are desired doneness. Transfer kabobs to plate to cool before serving. Who knew making kabobs on the grill was so easy and mess free? When you line your grill with foil, these fresh fruit and veggie kabobs won't stick to the grill grates. You also won't lose any pieces of fruit or veggies that may fall off the kabobs because the foil will be there to "catch" them! My family loved these and they are not veggie lovers! These were ok. The lemon dressing and pineapple made the bell peppers and vegetables alil too sweet for my taste. I would've preferred something spicy or sour. Enhances without overpowering. It was delicious! Really good! Guests liked it a lot, and the marinade was super tasty. I have made these on several occasions and they are always a hit. I love adding parmesan to them. This is a great recipe for summertime bbqs. It’s my go to for grilling vegetables. Followed the recipe exactly but instead of putting on skewers, used my grill basket. No vegetables left over! Even for those that don't "love" veggies, they even ate them.